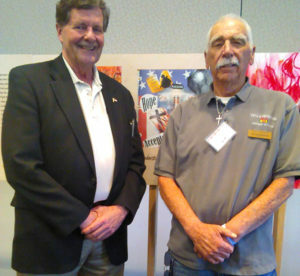 John Wartinger (left), a Veteran Services Specialist with Homes4Families, and Tom Hilzendeger (right), president and founder of Vets4Veterans, were both on hand for the Homes4Families event March 26. Sometimes it takes a village to lift a veteran’s family up from the depths of poverty, or at least the joint efforts of civic-minded folks running nonprofit organizations. Vets4Veterans recently joined forces with Homes4Families and other partnering entities to accomplish that venture for one veteran, his wife and their children, a family that hit a rough spot in life. The family’s identity is being withheld for privacy reasons, but their living conditions have been documented by the folks that rescued them. Tom Hilzendeger, president and founder of Vets4Veterans, said the administrators from Homes4Families approached his organization after learning they had purchased and refurbished a small transitional house in Lancaster, the first of a few projects they plan to attempt in coming years. That’s when the common mission of both organizations began. Enter another nonprofit — representatives from Mental Health America of Los Angeles in the Antelope Valley. That agency works with adults and transition-age youth dealing with mental health issues, people who are financially strapped — including homeless veterans. Mental Health America provides health care services and various other benefits such as housing services and life skill programs. Hilzendeger said a representative from Mental Health America referred the veteran and his family to Vets4Veterans, primarily because of the transitional house. In the case of the veteran referred by Mental Health America, who served in the U.S. Marine Corps from 2007 to 2014, he was living in a car with his pregnant wife and their two children. During his service, he had been stationed in Okinawa, Japan, then deployed to Afghanistan. 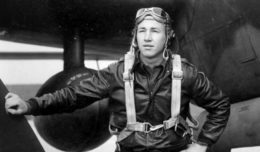 He had been awarded a Purple Heart. He also left the military diagnosed with Post-Traumatic Stress Disorder, which likely contributed to his bleak financial picture. The family’s third child is due to be born within the next two months. The veteran’s wife had been working, until she suffered some complications with the pregnancy and her doctor ordered her to rest until the birth. For this family, it seemed everything that could go wrong, did. The family has been living in the Vets4Veterans transitional house since early March, Hilzendeger said. They can stay in that temporary dwelling from six months to one year — the maximum. A representative from Homes4Families “came out and interviewed (the veteran) at our request,” Hilzendeger said. Miracles are possible, but they needn’t be spectacular, like winning millions in the lottery. For some people, finally having a place to call home is a miracle — simply put, the basics that most people take for granted. If you’d like to support the Vets4Veterans transitional home, visit their website at http://www.avvets4veterans.org/, or call 661-714-0545.